Each Emerald Sponsorship includes 20 VIP tickets; dedicated Semi-Suite; 2 reserved tables; full-page ad in the event program; prominent logo inclusion on event website and signage; early admittance into the event; access to the exclusive VIP Lounge; acknowledgement in all electronic event messaging; acknowledgment in post-event newsletter; acknowledgement in Food Bank's 2019 Annual Report; logo on event print ads; opportunity to provide company banner for display; signature wine glass for all guests; complimentary valet parking. Each Platinum Sponsorship includes 20 event tickets; 2 reserved tables; full-page ad in the event program; prominent logo inclusion on event website and signage; early admittance into the event; access to the exclusive VIP Lounge; acknowledgement in all electronic event messaging; acknowledgment in post-event newsletter; acknowledgement in Food Bank's 2019 Annual Report; logo on event print ads; opportunity to provide company banner for display; signature wine glass for all guests; complimentary valet parking for all guests; and valet parking. VIP Lounge - Benefits include naming rights on event invitation, live announcements during the event, and the opportunity to provide 20,000 additional meals for our neighbors in need. $5,000 + Platinum sponsorship. *Limited to 1 sponsor until filled. 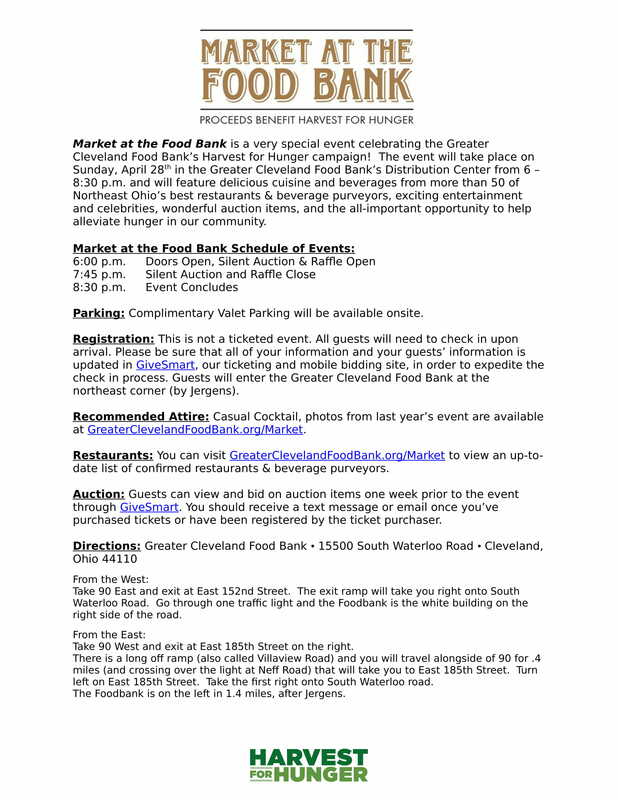 Each Gold Sponsorship includes 16 event tickets; 2 reserved tables; half-page ad in the event program; logo inclusion on event website and signage; early admittance into the event; access to the exclusive VIP Lounge; acknowledgement in all electronic event messaging; acknowledgment in post-event newsletter; acknowledgement in Food Bank's 2019 Annual Report; signature wine glass for all guests; and complimentary valet parking for all guests. Wine Pull or Raffle Sponsor - Benefits include naming rights on event invitation, area signage, collateral on area table (provided by sponsor), and the opportunity to provide 10,000 additional meals for our neighbors in need. $2,500 + Gold Sponsorship. *Limited to 2 sponsors until filled. Each Silver Sponsorship includes 12 event tickets; 1 reserved table; listing on event program, website and signage, acknowledgement in Food Bank's 2019 Annual Report; signature wine glass for all guests; and complimentary valet parking for all guests. Each VIP event ticket includes early admittance into the event, access to the exclusive VIP Lounge, a souvenir wine glass; is inclusive of all food and beverages; and complimentary valet parking. Each ticket purchase includes a $2 ticketing fee. Each General Admission event ticket includes a souvenir wine glass; inclusive of all food and beverages; and complimentary valet parking. Each ticket purchase includes a $2 ticketing fee. Valet or Coat Check Sponsor - Benefits include area signage, your company's promotional materials in attendee valet bags, and the opportunity to provide an additional 4,000 meals for our neighbors in need. $1,000+ Silver sponsorship. *Limited to 2 sponsors until filled. Each YP Pantry 4-Pack includes four event tickets; signature wine glass for all guests; access to the YP Pantry semi-suite; and complimentary valet parking for all guests. Each ticket purchase includes a $2 ticketing fee. I have read and agree to the Terms and Conditions and give my consent to Greater Cleveland Food Bank to process my personal data. I understand I can revoke this consent at any time.